Based on the Sturmgwehr 44 which was a German second war rifle. Complete with a 15-shot and 25-shot magazine. Fixed stock, the standard foregrip has been replaced with a RIS rail. GSG MP5 with 24 round magazine. Solid stock version in good condition. 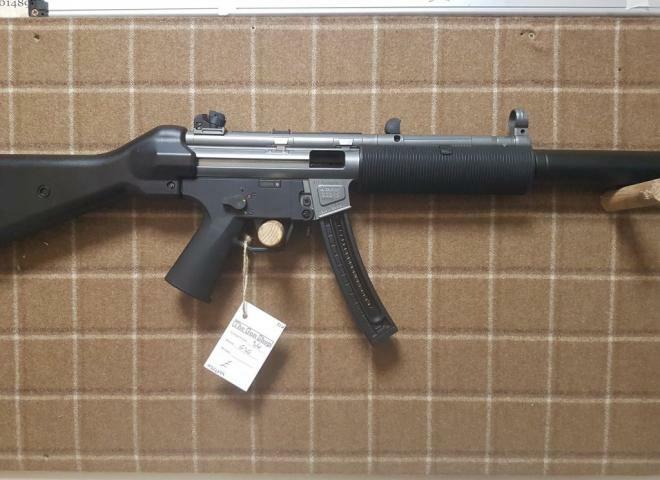 Heckler Koch MP5 Replica .22 LR semi-auto rifle - Comes with 2 magazines with double holder & red dot sight - Folding stock - Includes standard stock and fore stock - in good condition - NOW REDUCED TO ONLY £350.